The Cornerstone Bed and Breakfast Philadelphia ghost Tour package allows visitors to discover the secrets hidden in the shadows of America's most historic and most haunted city! Join the Ghost Tour of Philadelphia for a candlelight stroll along the back streets and into the mysterious gardens of Society Hill and Independence Park, where ghostly spirits, haunted houses and eerie graveyards lurk in the night! Complimentary tickets for two to the Ghost Tour of Philadelphia Candlelight Walking Tour. Call 215-413-1997 after making your reservation to schedule your tour. 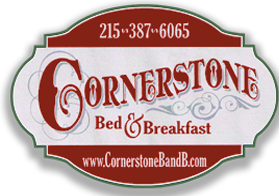 Have your reservation number ready and mention the Cornerstone Bed and Breakfast when scheduling your tour to receive two tickets free of charge. This package cannot be combined with any additional discounts or gift certificates. Book Your Ghost Tour Package Today!